Practical VSAT Training - Very Small Aperture Terminal (VSAT) and Wireless technologies are key components of modern telecom networks. VSAT and Wireless technologies will continue to provide opportunities now and in the foreseeable future for telephone, video, and Internet services.80% of Africa's international voice and data traffic is carried via satellites / VSAT. Why VSAT training in Africa? In order to build human capacity, Practical VSAT Training is the focus of the premier African VSAT Telecom Event - " Practical VSAT Training for Prospects and Opportunities in Africa". And it isn't just about opportunities in Nigeria, or Sudan or Liberia or South Africa - it is about AFRICAN VSAT Telecom prospects. It is organized in conjunction with a leading African VSAT company and one of the few GVF instructors in Africa (flown in from abroad) - who has worked on VSATs in over 22 African countries. FOCUS: Satellite Fundamentals, VSAT Network Design, Link Budgets,VSAT Service, Site Survey, Site Commissioning & Field Engineering. Do VSAT commissioning with: Panamsat, Intelsat, Astra, Eutelsat. Live & Practical VSAT. SETUP VSAT sites. August 23 and 24, 2007 in Lagos. Nigeria. NGN 50 000 per person. NGN 48 000 per person for two per company. NGN 45 000 per person for three to nine people per company. US$ 530 per person for two per company. US$ 520 per person for three to nine people per company. We are in addition providing logistics and transport service for participants attending from outside Nigeria to make things easier for international participants attending the VSAT training. This will involve a Jidaw staff meeting you at the airport, transportation from the airport to hotel, to training center for 2 days and back to the airport when you are leaving. International participants need to keep us informed about their travel arrangements. For urgent arrangements you can always contact us on 234-8035007778. This bonus competitive pricing model costs you up to 60% less than other training alternatives in the market. Please note that US dollar fees are subject to change due to fluctuation in exchange rate. only be done on first come, first served basis. Register and confirm your place AS SOON AS POSSIBLE. Commitments, Group discounts and instalmental payment are allowed based on arrangements. (Limited spaces so First come, First Served). For obvious logistic reasons, bookings can only be confirmed for those who make commitments. Unfortunately no exceptions will be made. "I got to know about Jidaw and the VSAT training through Google search. Check for yourself you will see that Jidaw is number 1 in the Google search for VSAT Training. The response I got from them was professional and timely. I also confirmed all the information they gave me through the Nigerian embassy in Mozambique. This further proved their credibility. And when I assessed their pricing and other content and benefits compared to others, I knew this was the place that would deliver results in a cost-effective manner. It was simply the best option. 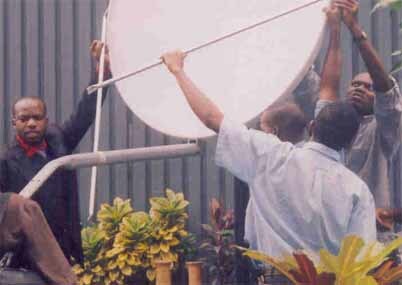 Jidaw Systems Ltd is one of the best Company in Africa offering this important training on VSAT Satellite communication. I'm very satisfied". You must please arrange with us as soon as possible. Bookings will only be confirmed after you have made payment. Unfortunately no exceptions will be made without prior arrangements. Business and Career opportunities. Today, nobody disputes the importance of wireless communications. It continues to change and evolve. But for Africa it's not just about consumption. Skills must be grown to keep up with technology, business and societal needs, and most importantly to drive the knowledge revolution. This in turn is creating tremendous business and career opportunities for many invest who in high-demand VSAT and Wireless skills and knowledge. 80% of Africa's Internet / international voice and data traffic is carried via satellites / VSAT. 80% of Africans live in rural areas with no land-based telecoms infrastructure. Demand for VSAT in Africa is fuelled by: inadequate telecom infrastructure, banking and insurance consolidation, e-business, e-government initiatives, e-payment services and public demand. NOBODY IS COMING FROM MARS to meet these needs! You don't have to a spectator in your own continent! Learn from satellite communications field experts. Prepare to learn from experts who have over 17 years of industry experience in VSAT and wireless connectivity all over Africa. The facilitator is a Global VSAT Forum (GVF) qualified instructor. Now you don't have to reinvent the wheel. This training will give you easy-to-follow steps and professional guidance that work to help you succeed. The Hands-ON VSAT Field Engineering course is being organized to provide learning, networking and VSAT opportunities. There's a wireless revolution underway! And we don't have to be spectators. VSAT and Wireless is here to stay and many are taking the initiative. Become a competent and qualified VSAT Installer. This course was developed in response to the growing telecom need that is escalating demand for well trained, certified and competent telecom professionals. Register NOW because you can create opportunities for yourself by becoming a competent and qualified VSAT Installer. The African VSAT Event for Practical VSAT Field Engineering program is a two day event that provides excellent VSAT knowledge and networking opportunities. The VSAT Training event is the ONLY event in Africa that brings VSAT value, learning, networking and opportunity together in one place. to achieve and advance -commitment plus effort.